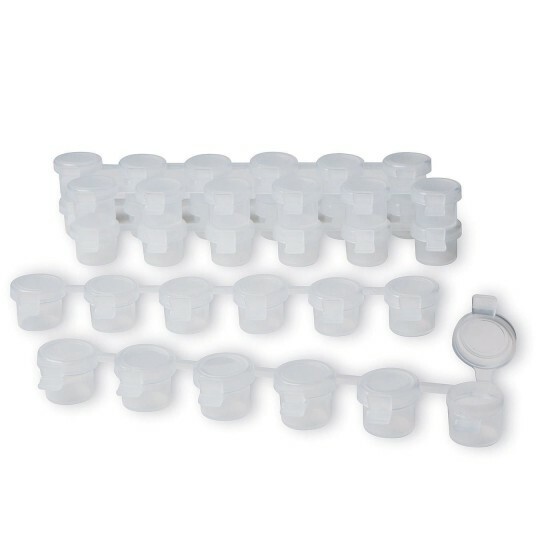 Pack of 6 plastic strips, each with 6 easy-open, snap-shut cups that hold 1/12 oz each. Great for portioning out and storing paint for individual projects. Each plastic strip includes 6 easy-open, snap-shut cups that hold 1/12 oz. each. Great for portioning out and storing paint for individual projects. 6-1/2"L. 6 strips. They do break easily a few of the sets came broken but once you get the hang of opening them they work well. They are hard to find in large quantity but I will probably try another brand before I buy these again. I used these in Art Therapy groups I facilitate. I loved that I could fill them with my own palette of colors. My patients often take more paint than they need the paint strips cut down on waste. Some needed help opening the containers but mastered it once I had shown them. Best for individual projects when artists may not want to share paint. Portable and make your own color combination.